Hip replacement surgery can restore your mobility after a hip fracture, or after the surgical replacement of a joint damaged by arthritis. Doctors replace the hip joint with an artificial joint. After several days hospitalization, you'll return home to continue your recovery. For the first several weeks you'll have stitches and you won't be able to take a bath, but you can shower, as long as you follow a few precautions. Install safety grab rails in your shower before you have the surgery. Though you'll be able to stand for limited periods of time immediately after your surgery, the safety rails will provide extra stability. They'll also make it easier for you to lower yourself into a shower chair. The U.S. Department of Veterans Affairs recommends mounting a grab bar with screws that go into wall studs behind the shower. Rent a shower chair from a medical supply company. The shower chair allows you to sit while you take a shower. Choose a chair with a back for added stability. Adjust the chair as tall as possible so that your legs are almost fully extended when you sit. Attach a hand-held shower nozzle to your shower. This allows you to hold the head and direct the flow of water where it's needed. Enter the shower, using crutches or the grab bars to steady yourself. Slowly lower yourself onto the shower stool, supporting your weight with your good leg and keeping the leg on the side on which you had surgery extended as much as possible. Turn on the water and use the handheld nozzle to direct the flow of water to wet yourself. 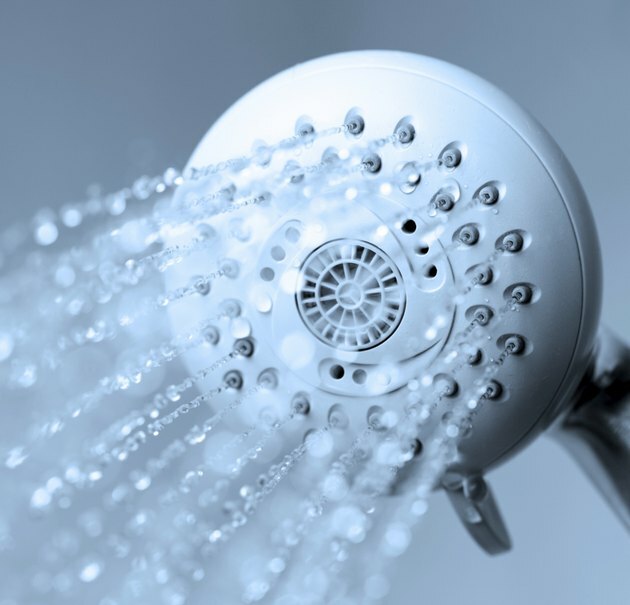 Avoid focusing the water on the incision, though the University of California San Diego Health System says it's OK if the incision gets a little wet; you don't want to soak it. Shut off the water. Support yourself with the grab bars as you stand. Outside of the shower blot your incision dry with a towel. Install grab bars in the wall around your tub. Mount the bars with long screws that go all the way into wall studs behind the shower. Install a handheld shower head. Remove your current shower head and screw on the hand-held attachment. Make sure the hose is long enough to reach you when you sit on a shower chair in the tub. Rent a shower bench from a hospital supply company. Lay a nonslip rubber mat in the bottom of the tub and set this bench on top of the mat. Make sure the bench cannot slide around. Support yourself with crutches as you stand beside the tub. Stand with your good leg next to the tub. Set the crutch on your good side in the tub. Lean your weight on this crutch and step into the tub with your good leg. Balance on both crutches. Bend the weaker leg back at the knee. Don't bend your hip too far and don't try to swing your leg forward over the tub. With your leg bent, scoot over and bring your other crutch into the tub. Steady yourself with your crutches or by holding onto the grab bar and lower yourself onto the shower chair. Hold the handheld shower nozzle and turn on the water. Rinse yourself, lather, then rinse again, keeping the water pointed away from your incision. Turn off the water. Stand with the aid of your crutches. Put the crutch on your weak side on the floor outside of the tub. Bend your knee and scoot over until your leg is out of the tub and you can lower your foot to the floor. Keep most of your weight on your good leg. Balance your weight on your crutches and lift your good leg out of the tub onto the floor. Stand with your weight on your good leg and lift the crutch on that side out of the tub and onto the floor. Blot your incision with a towel to remove any excess water. Don't shower until three days after your surgery, or whatever period of time your doctor advises.